April 28, 2018 By christina THIS POST MAY CONTAIN AFFILIATE LINKS. PLEASE READ MY DISCLOSURE FOR MORE INFO. Looking for fresh cocktail plants to add to your garden? In this article I’ll show you the top X plants you can keep around the house for the perfect drink anytime. Once you start growing your own herbs and plants, you realized how much yummier everything tastes when you can snip the ingredients right from your own garden. Here are our top 13 plants and herbs you can start growing today for your cocktails. The perfect addition to your cocktail garden. Mint is very hardy and you can snip off some leaves for the party anytime. Of course some favorite drinks to make with mint are mojitos, or as my sister likes to call them, toothpaste drink. Add a few leaves and don’t forget to muddle. The mint leaves have an oil in them and muddling helps release the oils for a more fragrant drink. Make sure you plant your mint in its own container since it’s very hardy and will take over everything otherwise. We just started growing cilantro and it’s been fairly easy so far. We heard it can be difficult to grow cilantro. It’s great for garnishment and muddling in different cocktails. If you like floral tastes in your cocktails, then you can grow lavender to add some floral ingredients. Lavender also has calming and soothing effects, so growing it around the house will help with that as well. Keeping thyme on hand makes muddling drinks with thyme easy. You can also choose to infuse thyme in anything or use it to make bitters. Strawberries are a fun addition to your garden. Just start growing them in the winter and they will be ripe just in time for the spring cocktail events. These little guys add a great sweet and tart addition to any cocktail you want to make. You can make refreshing cocktails or yummy simple syrups with hibiscus. Look at this awesome and simple hibiscus drink. You can get cocktail citrus plants that can have Meyer’s lemon AND Persian limes, which is great for any citrus infused cocktail you’re looking for. These become the staple to all your cocktail drinks. You can use the lime juice for the main cocktail or use it in garnishing your cocktail. Moscow mule! Ginger has really grown in popularity for cocktails recently. The bite of the ginger tastes great in many cocktails. You can grow this root and keep it handy for several weeks after you harvest it. You can use lemongrass for infusing spirits if you’re into that. Combine two of the herbs on this list to make Ginger Lemongrass Margarita or use this recipe to make the perfect lemongrass syrup. 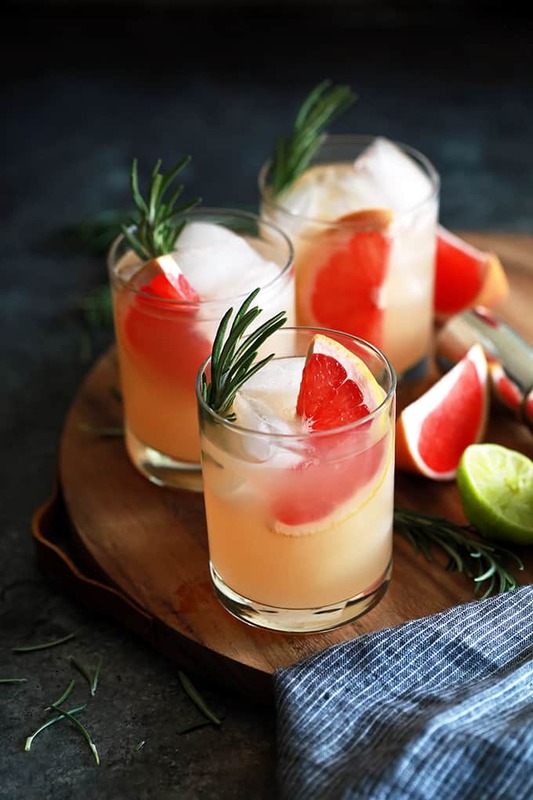 Many like to use rosemary as a garnishment to sever different cocktails. It’s also great in baking rosemary bread. Use lilac to make liquers or syrups to add to your drinks. Violet Lilac Wedding Cocktail the perfect cocktail to toast at your best friend’s wedding. Lilac Lemonade with Blueberries one of the most refreshing sounding drinks on the list. You can’t forget about tomatoes for Sunday brunch bloody marys. You don’t have to grow the big ones either. Just keep small or medium sized tomatoes to grow for your cocktails. Although there are several others you could add to your garden, some of them are more work than they’re worth and it’s just easier to get from the grocery store. This list should be easy enough to grow at your house with minimum effort. Check the zoning in your area to make sure you can grow these items easily and adjust for your areas temperatures. Once you have the plants, also make sure you have the following kits for the perfect bar setup. Make sure you replant your herbs in larger containers. When we got our mint, it was already flourishing, but needed room to grow and started to look very sad. As soon as we planted it in a larger container, it seemed to double in size overnight. Put enough holes in the containers to allow the water to pass through. We don’t want the water to build up in the soil. This promotes root rot with too much water. Instead we want to allow the soil to stay moist and let the excess water run through the pot. Test the plants for direct sunlight. Most will want at least a little direct sunlight, but be careful not to give it too much sun. Cilantro can be especially finicky, whereas strawberries love all the sun they can get. We have a tendency to just pick off the leaves that we want. Don’t do this. Instead, get a pair of pruning scissors to cut a stem below a leaf. This will help promote growth after you’ve removed some herbs for your cocktails. Don’t skimp on the potting mix. Make sure to get nutrient rich potting mix for the plants. Mix and max your pots arrange large and small plants in a visually appealing way. We made a special planter that would fit on rollers so we can put it in and out of sun when needed. It’s a simple 2′ X 4′ planter made out of pressure treated pine with weed fabric in between. Whatever cocktails you get into this season, just start with one or two plants so you don’t get overwhelmed and by the time you’re season is over, you’ll realize just how many plants you have in your cocktail garden to entertain with. In creating this post, I realized we’ve moved up to having more plants that I thought we did for cocktails. We started with our favorites first: citrus, mint, strawberries, basil, cilantro (because tacos) and will add more this season since we’ve gotten use to growing plants in our backyard.